Shane Long's first international goal ensured the Republic of Ireland came home from their American trip unbeaten as they drew with Bolivia near Boston. Alan O'Brien's cross from the left found the Reading man unmarked to head home, but a minute later Miguel Hoyos levelled after a goal-mouth scramble. Manager Steve Staunton blooded several youngsters in an experimental side. Substitute Daryl Murphy had a chance to win it in the second half but failed to connect with Stephen Hunt's free-kick. Staunton kept just two of the seven newcomers who played in the draw with Ecuador in Giants Stadium on Wednesday, with Alan Bennett and Darren Potter keeping their places. The Republic began well, with Anthony Stokes chipping just over and Long having a goal-bound shot unwittingly deflected wide by the goalkeeper before he finally hit the target. But Bolivia were soon level as Hoyos was quickest to react after Nick Colgan pushed Juan Carlos Arce's shot onto the post. Replacement goalkeeper Wayne Henderson did well to deny Diego Cabrera after the break, and Arce hit the post from an angle, but a draw was a fair result. Bolivia: Suarez, Hoyos, Mendez, Pena, Alvarez, Garcia (Lima 61), Mojica, Reyes, Vaca (Galindo 74), Moreno (Cabrera 45), Arce (Pinedo 69). Subs Not Used: Andaveris, Bengolea, Campos, Galarza, Gatti Ribeiro, Ortiz, Pizarro, Rodriguez, Salinas, Sossa. 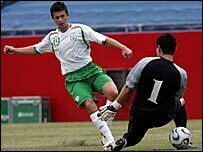 Rep of Ireland: Colgan (Henderson 45), O'Cearuill, Bennett, Peter Murphy (O'Halloran 45), Kelly, Gamble, Kilbane (Hunt 66), Potter, O'Brien (Gleeson 77), Long (Kevin Doyle 54), Stokes. Subs Not Used: Bruce, Colin Doyle, Keogh, Miller, Daryl Murphy.